Will WestConnex take its toll? Given the long history of failed toll roads in Australia and the absence of any details being released on WestConnex, the Greens built their own financial model. Mehreen Faruqi explains what they found. Since entering parliament in mid-2013, I have noticed a growing and undeniable murmur of serious public discussion concerning the future of transport in our state. In the last few months, particularly during and since the state election, this murmur has turned into a roar. Transport experts, academics, community groups, activists and politi­cal commentators are all weighing in on what the ideal transport solutions are for our communities. Almost no day goes by without a new opinion piece, speech or public comment about the direction that transport planning is taking in NSW. The big questions – what do we need to build, to improve, to expand – are firmly in the public spotlight. This is unsurprising. 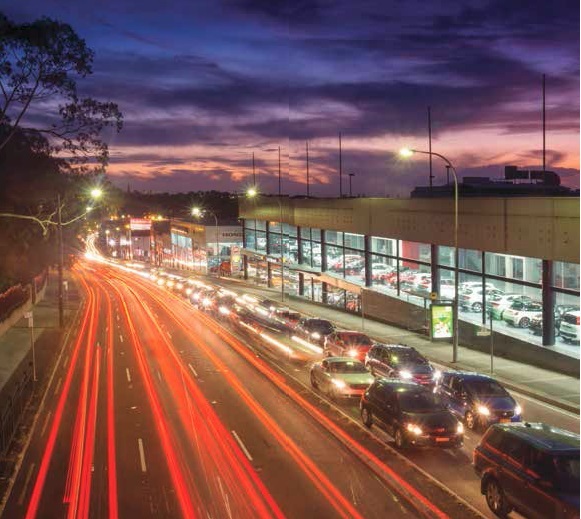 We are at a crit­ical moment for transport planning and infrastructure in NSW. After 16 years of little attention from Labor, the Coalition government has since 2011 put an enormous amount of effort into imposing its agenda on NSW people. But, is this ‘addiction’ to toll roads the way to solve Sydney’s traffic conges­tion? Or indeed the best way to meet the current and future needs of the people and the environment of NSW? Infrastructure must be built with an integrated approach, with attention paid to where people live, where they work and what amenities they need close to them. We must view transport as a crucial aspect of a broad plan to modernise our cities and regions, and to make them liveable, vibrant and sustainable places for people. But unfortunately, this holistic approach has been missing from decision-making in NSW for too long. Transport planning has been piece­meal with a heavy bias towards toll roads and tunnels, which have been failures on transport, environmental and financial grounds, not just in NSW but across Australia. 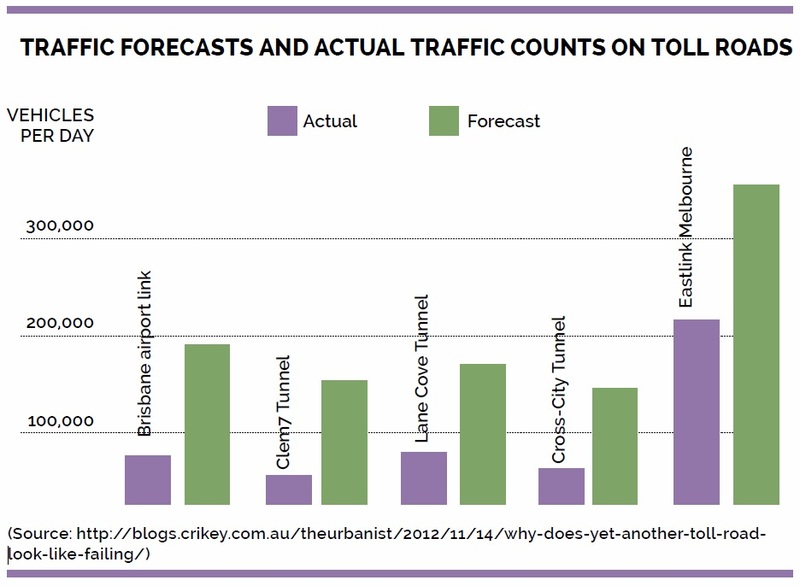 In the push to justify what seems like an unending appetite for road building, traffic forecasts are often much more optimistic than what actually eventuates (below). This has led to financial disasters like the Cross City tunnel and the Lane Cove Tunnel where actual traffic ‘in’ was only 50% and 38% respectively of what was fore­cast to justify their case. This mismatch may be one reason why Governments have been so secretive about detailed information on new proposed toll road projects. Since the announcement of WestConnex three full years ago, the public still hasn’t seen a business case or a cost-benefit analysis for the project. The coalition government refused to release the full business case, even after my order for papers was successfully moved in the NSW Upper House last year. But the documents that were released did bring to the surface emails and corre­spondence between people working on the project who were frustrated with how to go about modelling and planning for, what seemed to them, a difficult project to justify. Given the long history of failed toll roads in Australia and the absence of any details being released by the Government on WestConnex, late 2014 I decided to build a financial model to assess whether this toll road could ever be financially viable. The minimum toll cap would have to be at least $26, almost 3 times the toll cap promised by the government ($7.35 in 2013 dollars or $9.60 in 2023 dollars), even with every car and truck paying the maximum cap every day of the year. Result 2: Revenue shortfall with toll cap currently promised by the GovernmentWith a toll cap of $9.60 in 2023 dollars, there would be an annual shortfall of $626,000,000 to just break even. The basic assumptions for the model can be found in the box at the end of this article. It’s clear that the economic case for WestConnex doesn’t add up and that WestConnex will be a financial disas­ter even worse than the Lane Cove Tunnel or Cross City Tunnel. It will result in either very high tolls, which will discourage people from using it, or need a massive publicly funded bailout. The modelling also shows that the WestConnex toll road makes money on the re-tolling of the M4, but loses money on other sections such as the St Peters to Parramatta Road tunnel (M4 to M5) link, raising speculation about whether this section will be built at all. No private sector investor will touch WestConnex with a ten foot pole because the model is financially unvi­able. This would gridlock Sydney for decades to come while sucking public money away from public transport projects. The community already knows that toll roads do not solve transport problems and that WestConnex will only increase pollution and conges­tion. The Greens’ financial modelling now predicts that WestConnex will be another addition to the list of road tunnels doomed for failure.Projects like WestConnex are classic cases of attempting to solve a problem by doing more of the same. Sydney’s road system is choked up – no one can deny that – but our task surely is to investigate alternative transportation options, rather than build more of the same unsustainable infrastructure that led us to where we are now. National and international evidence shows that a heavy focus on road-build­ing at the expense of public transport has adverse environmental, social, and economic outcomes. Integrated, affordable and efficient public trans­port is a hallmark of every great global city. By scrapping WestConnex and investing in world-class public trans­port, the people of Sydney can eventu­ally get the transport they deserve. Revenue calculated at 100,000 cars each day, every day of the year, all of which pay the maximum toll cap of $9.60 (in 2023 dollars) and 3,000 trucks a day, every day of the year, pay the toll cap (which is three times the car toll). – Stage 1a (M4 Widening – $0.45 billion) and 1b (M4 East – $2.85 billion) is assumed to have no financing cost as it is publicly funded by the State and Federal Government. – Stage 2 (M5 East – $4.5 billion) will be funded by a mix of concessional Federal funding (with an assumed return of 3.4% – the ten year Treasury bond rate) and private sector financing (with an assumption of a required return of 9%). – Stage 3 (M4-M5 East Link – $3.7 billion) is to be fully private sector financed, also with a required return of 9%. Maintenance and operating costs are calculated from first principles and past experience on similar tunnels/motorway projects. Depreciation is calculated according to the various components of the WestConnex, their capital cost and depreciation period for each. ◄ How does public transport stack up against motorways?